Gordon W. Smith, PhD, dedicated much of his life to researching Canada’s sovereignty in the Arctic. A historian by training, his 1952 dissertation from Columbia University on “The Historical and Legal Background of Canada’s Arctic Claims” remains a foundational work on the topic, as does his 1966 chapter “Sovereignty in the North: The Canadian Aspect of an International Problem,” in R. St. J. Macdonald’s The Arctic Frontier. This work is the first in a project to edit and publish Smith’s unpublished opus - a manuscript on “A Historical and Legal Study of Sovereignty in the Canadian North and Related Law of the Sea Problems.” Written over three decades (yet incomplete at the time of his death in 2000), this work may well be the most comprehensive study on the nature and importance of the Canadian North in existence. 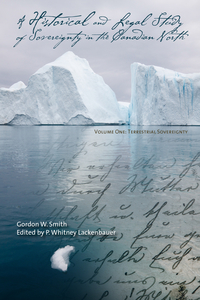 Volume 1: Terrestrial Sovereignty provides the most comprehensive documentation yet available on the post-Confederation history of Canadian sovereignty in the north. As Arctic sovereignty and security issues return to the forefront of public debate, this invaluable resource provides the foundation upon which we may expand our understanding of Canada’s claims from the original transfers of the northern territories in 1870 and 1880 through to the late twentieth century. The book provides a wealth of detail, ranging from administrative formation and delineation of the northern territories through to other activities including government expeditions to northern waters, foreign whaling, the Alaska boundary dispute, northern exploration between 1870 and 1918, the background of Canada’s sector claim, the question concerning Danish sovereignty over Greenland and its relation to Canadian interests, the Ellesmere Island affair, the activities of American explorers in the Canadian North, and the Eastern Arctic Patrol. The final chapter examines the Eastern Greenland case and its implications for Canada. DR. GORDON W. SMITH (1918-2000) was a historian who spent his early career as a professor in Canada, the West Indies, and Africa. He devoted the last twenty-five years of his life to researching and writing the international history of the Canadian Arctic.